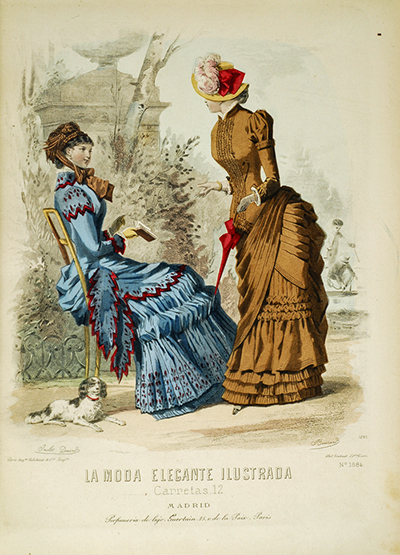 Published weekly from 1842 through the turn of the 20th century, La Moda Elegante Ilustrada, Periodico de las Familias (Illustrated Elegant Style, A Family Magazine) was nineteenth century Spain's leading fashion magazine. 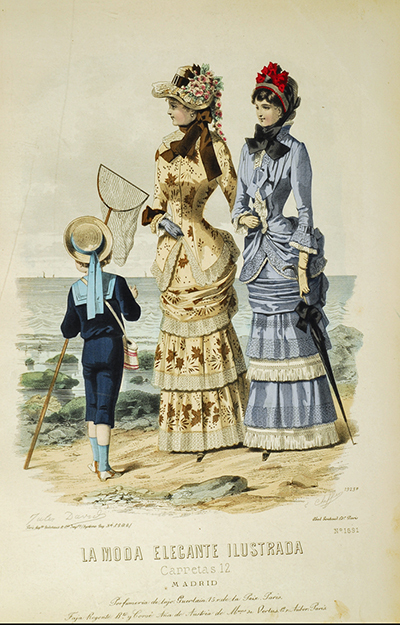 The plates within La Moda Elegante Ilustrada depict the latest fashions from Paris including seaside attire, day dresses, fashions for a day in the country, ball gowns, as well as children's clothing. It was Spain's Vogue and Harper's Bazaar, the go-to magazine for Spain's upper class women. This, the annual for 1882, features thirty-two hand-colored steel-engraved plates printed by A. Godchaux, and Guilquin, of Paris with designs after Adele-Anais Toudouze; F. Bonnard; A. Chaillot; Jules David; and P. Lacouriere. Notable is that in more than a few of the plates women are reading or holding a book, reflecting, as current fashion magazines do, current trends and customs in culture, in Spain and, by extension, those of Europe's upper class, all following the French example. 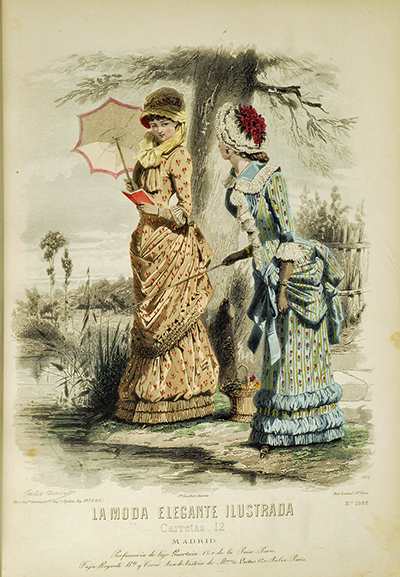 Books were a fashion accessory and reading a fashionable activity for ladies who wished to be au courant. Reading, in short, was cool. 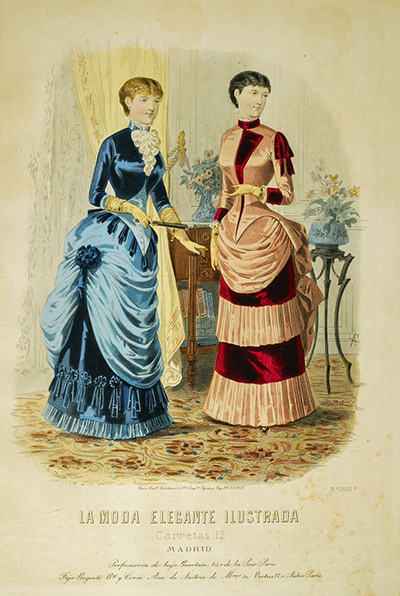 Annuals of La Moda Elegante Ilustrada are extremely scarce, with only one institutional copy of the 1882 volume worldwide, at University of Granada, according to OCLC/KVK. Princeton and three libraries in Spain appear to have multiple volumes from the series but it is unclear whether 1882 is amongst them. Only two volumes in the series have come to auction since ABPC began indexing results in 1923, for 1893 and 1902. No copies of this, the 1882 volume, have been seen at auction within the last ninety years. [FASHION]. 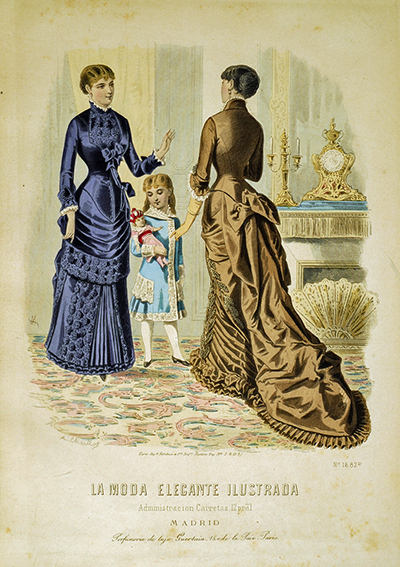 La Moda Elegante Ilustrada. Periodico de las Familias. Cromos Pertenecientes al Año de 1882. 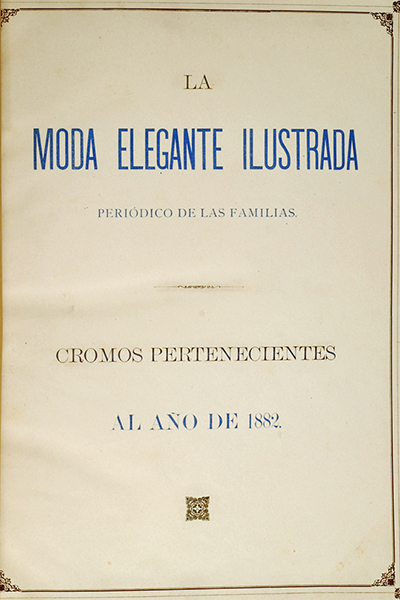 Madrid: [Officinas de La Moda Elegante Illustrada], 1882. First edition. Folio (13 7/8 x 10 1/8 in; 354 x 257 mm). pp. 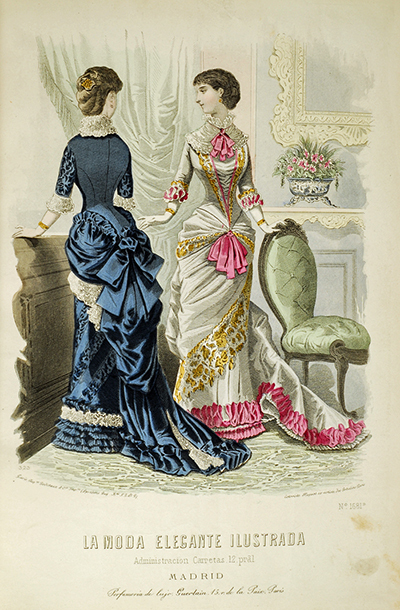 Thirty-two hand-colored steel-engraved plates, printed by A. Godchaux, and Guilquin, of Paris. Designs after Adele-Anais Toudouze; F. Bonnard; A. Chaillot; Jules David; and P. Lacouriere. Plates untitled but numbered 1680-1700 (eleven in numerical series with letters, i.e. 1681D), and 2247E (final). Colas 2069. Lipperheide 4642. Hiler, p. 619. Holland, p. 88. Gorgeous plates! The detail is astonishing. Such lovely dresses! Also, I assume you meant with our thanks, not "with out thanks."